Most of India’s Olympic heroes and star cricketers are inert when it comes to standing up for social and political causes, and raising voices for justice in the larger realms of the common man. In 1982, Socrates went up on stage addressing two million people on Cathedral Square in Sao Paulo, saying if direct presidential elections were not happening, he would go out and play in Italy (Pic: Twitter). Football, the FIFA World Cup, the tales of the champions – from winners France as well as the rest of the 31 teams – thrilled us and left us drenched with passion. This year’s World Cup is history now, joining the editions of the past where some of the greatest footballers stamped their presence with panache. However, beyond those moments of sheer magic on the pitch, there are the tales from history that remain with us, reminding us of the power that football in specific, and sport in general, wield in bringing about change to this world. These are tales of footballers, great as they are on the field, awakening to the need of the hour to go beyond their call of duty, beyond 90 minutes, and become inspirations for generations to come. The players, in turn, got anointed with a crown of greatness that transcends sporting field and footballing epitaphs. When we talk about such champions in sport, the first name that comes up is Muhammad Ali. Football has seen many Alis stand up for a larger cause: From Didier Drogba in Côte d’Ivoire (Ivory Coast), who used the power of the beautiful game to end a bloody civil war in his country; to Carlos Caszely, who paid the price for saying ‘no’ to dictatorship and the rule of General Augusto Pinochet in 1973. Caszely’s mother was captured and tortured for her son’s political stance, but the footballer stood firm, just like Drogba, who, after helping Ivory Coast qualify for the 2006 FIFA World Cup, challenged President Laurent Gbagbo to end the civil war. These are stories which should act as inspiration for sports stars across the world, including our Indian heroes, especially our cricketers, who are revered as demigods in our country. However, almost all of them are inert when it comes to standing up for social and political causes, and raising voices for justice in the larger realms of the common man. We are talking here of athletes including legends such as Sachin Tendulkar, who, in spite of being a Member of Parliament, has hardly stood up in matters that afflict his sport, forget other causes. We have our Olympic celebrities, and our Virat Kohlis and MS Dhonis, whose brand worth and popularity among advertisers, indicate their power to sway and influence the masses. However, beyond product endorsements and occasional peripheral social causes, they actually don’t think beyond their personal agenda, and the ones set by their brand managers, their clubs, and their sports bodies. This debate is something every Indian should indulge in, an introspection questioning the base of the pedestals on which we have placed some of our champions. The counter-argument to this would be that athletes are professionals in their realms and they should have the choice to stick to their bread-and-butter strengths and areas, and do their duty for the country by winning on the playing field. No doubt, they should. However, a sports star is not a socially isolated phenomenon. Athletes grow out of the society, affected/inspired by the factors that touch each one of us. They may have a buffer zone created by their stardom while at their peak, but that insulation is fickle as we all know. This argument has been around in India; it has always been thrown with malice at the many Alis and Drogbas of the world down the years. The whole nation of Brazil, its businessmen, its journalists, and the military dictatorship at the time, used this same argument to criticise the cry of democracy that the great Socrates and his club, Corinthians, began in the late 1970s. Corinthian Democracy, later, by early 1980s, became the voice of Brazil, and Socrates became “Brazil’s Che Guevara”, becoming the most singular footballer among the greats the South American nation has produced. Corinthians’ Democracy stood for the poor, for football and for democracy against the military dictatorship which began in 1964, and was stifling Brazilian society. The movement began at Corinthians club in Sao Paulo, with footballers Socrates, known as ‘Doctor’, Wladimir, Walter Casagrande and then club president Adilson Monteiro Alves as the central figures. “We couldn’t continue living like the way we were. We had to break with conservatism. We [Corinthians club players] started defining things together,” says Alves, a sociologist, in a feature video published by Al Jazeera as part of a series, Football Rebels, anchored by former France footballer Eric Cantona, chronicling the lives of footballers who fought for justice and a larger cause. The biggest match of their lives had begun for that group of Corinthians players. The idea was simple. Socrates and his Corinthians mates wanted to show the country what democracy is. By then, almost two decades into the dictatorship, people had forgotten the meaning of voting and the power that it brings to the common man. They were afraid of many things and the players decided to use the power football wields in Brazil to make a change. Everything became democratic in the club, and it was not just the players who were involved in the voting – the support staff, masseuse, and everyone else in the club structure were part of the democratic process at Corinthians. In fact, the democratic process was so ingrained that even small decisions such a player being allowed to leave to meet his family or lover, or when to stop the bus for taking a toilet break, were all put to vote. The aim was to democratise expression. The jerseys had Corinthians’ Democracy inscribed on the back, with red spots, signifying blood drops. The symbolism was clear, and alarmed the government, who, at one point, summoned the players to question them. Their reply was simple: “It’s just football,” and they presented a jersey to the president. "Compare it with what happens in society. You take several unhappy couples and in with them you put a really happy couple who are in love. It contaminates the whole group. That's how it was with us," Socrates had said in an interview before his death in 2011. Washington Olivetto, a publicist, who was behind most of the symbolic campaigns of Corinthians’ Democracy, remembers the founding principles. “Corinthians’ Democracy concerned football but not only football. It embodied the dream of every Brazilian of removing the dictatorship and a return to universal suffrage,” he says. That became a big hit and while Socrates and a very talented Brazilian football team won hearts at the World Cup under Tele Santana, despite winning the trophy, things were moving towards a finale at home. Corinthians were winning on the football pitch as well, while Corinthians’ Democracy had created a wave in Brazil. Every footballer in the country wanted to join the club, or be part of the wave. 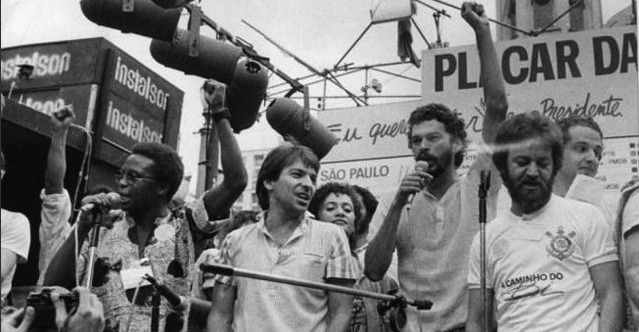 Socrates then took a risk and went up on stage addressing two million people on Cathedral Square in Sao Paulo, saying if direct presidential elections were not happening, he would go out and play in Italy. He stayed in Brazil, however, listening “to his heart”, as friends now fondly remember. In 1984, elections were announced, and Socrates and Co. were instrumental in inspiring people to come out and vote. They never suggested who to vote for, but wanted everyone to come out and exercise their franchise as free men and women. The opposition won, signalling the end of the dictatorship. Now, Brazil might seem a far off world now, and Socrates’ stand, more than three decades ago, seems from a different era altogether. Then again, the world may have changed, but not all changes have been for the better. And bringing about the right kind of change, for a better world, is something that is the responsibility of each individual. However, stories such as Socrates’ should act as inspirations for the ones among us who have the clout to reach the masses to make a larger impact.